Hope you caught the announcement this week on boosting e-learning. My worst fears about Digital Britain are coming true. Hot on the heels of the retro Digital Britain day and visionless report, we have the first major act and it’s the same old establishment rot. The Open Learning Innovation fund will team up established laggards with large US corporations to fritter away yet more of your money. Have they learnt nothing from BBC Jam, UKUniversities, NHSU etc etc. Having already poured well over £100 million into these disasters, the powers that be are determined to burn even more of our money. And it gets worse. It will be chaired by Dame Lynne Brindley, the CEO of the British Library. So the future of innovation in e-learning will be in the hands of a librarian! Don’t worry though, Microsoft are also on the board (yikes! )....and the British Council (why?). Then there’s the good old BBC in as advisors. So BBC Jam has been quietly buried. The very people who frittered away tens of millions in a failed attempt to produce content (while destroying the market) are seen as the best of breed advisors. You couldn’t have gathered a more useless, backward looking bunch of laggards if you tried. Despite more than doubling the spend in UK schools, only marginal, measurable improvement has been seen. Yet even this may not be down to schools themselves. Interesting data is emerging about the dramatic increase in that same period of private tuition. The Sutton Trust has found that 43% of 11-16 state pupils in London have been tutored. Could it be that schools are delivering less and that private tuition and parental support are the real causes behind the measured improvement? Teachers who fight tooth and nail against the influence of the private sector in schools are coining it of an evening through private tuition. And how many of those thousands of tutors declare this on their tax returns? The acceptance of middle-class 'cash-only crime has always been part of British culture. How many have done a risk assessment when they deliver this service from home? How many have a contract (as they should with the parents/carers)? How many have insurance? What would happen if there was an accusation of assault or inappropriate conduct? Schools spend unbelievable amounts if time on this stuff (Governors meetings are largely about reading and approving such policies), yet how many tutors pay even lip service to these issues when moonlighting? How many have even checked with their employer that they’re allowed to do this, especially with students from the school in which they teach? I’m fine with teachers doing private tuition, although I’m not fine when it’s combined with complaints about long hours and being worked too hard. If you don’t have time to mark homework, or commit wholly to your main job, I’m not sure you should be topping it up with more teaching. I’m also against the anti-corporate views expressed by teachers in schools, who are quite happy to play the game themselves outside of the school gates. Wouldn’t it be better to get this all of this into the open? Why doesn’t the school openly offer these services on behalf of the teachers who want to make some extra cash? It’s all so ‘cloak and dagger’ at the moment. I suspect that it’s all a bit of an embarrassment. You know you’re in for disappointment when the opening sentence is, “On 26 August 1768, when Captain James Cook set sail for Australia, it took 2 years and 320 days.....” Stevie boy then compares this with Google. Some comparisons are odious, this is just stupid. The report landed in my inbox like an octopus falling from a tree. Is this the best they can do? Carter’s badly written, novel-length report is a charter for the analogue professions; luvvies, farmers and lawyers. It’skewed towards old media like TV and radio, lacks vision, focuses on the past not the future, and stinks of lobbying by the professions. Where’s the citizen in all this? Most of us will simply end up paying more and being threatened by lawyers over peer-to-peer use. The London Luvvies, and press, immediately leapt on the BBC/ITV/C4 funding stuff. Who gives a toss? The BBC, ITV and C4 are TV companies. The digital future is about the web, not TV! I don’t give a damn how they slice up the licence fee among themselves. In practice this brouhaha is only of interest to London media types. The reality is that there’s been a vast overpayment to the BBC for the Digital Switchover (a mess of a project) that would be better spent elsewhere. Simple as that. The National Audit Office calculate this at around £250 million. How did that happen? It makes £75 million wasted on BBC Jam seem like a bar bill. The controversy in all of this should be incompetent budgeting, not slicing up the TV tax? TV people love to think that they’re creating the digital future, when the reality is that they’re mired in the past. Can you name a single person in TV, or from a TV background, who’s created a Google, Youtube, Wikipedia, Facebook, Myspace, iTUNES, Flikr,Twitter or anything meaningful and long-lasting on the web? Of course not. While TV people run conferences on the future, businesses and geeks create it. Again, who gives a damn? Radio’s an old analogue medium that’s not worth mentioning in this report. We’re going to scrap millions of domestic and car radios at an enormous price environmentally to replace them with expensive digital radios that give you the same thing? Radio’s an analogue footnote. Is Carter boss of Inland revenue? So Carter has decided he’ll slap a poll tax us urban types to pay for laying in broadband for those lovely country folk. So I pay for twats who run around in 4X4s while living off vast EC farm subsidies. If you want to live in the country for the ‘peace and quiet’ why do you want the cacophony of the internet and broadband access to play Halo? They’re perfectly happy listening to crap like the Archers. Leave them alone. And if we do go ahead and give BT and others this money, surely we should have a stake? When we subsidised the banks, we took equity. This is public money raised by a tax, so why not demand a stake? Carter’s revealed his background here – he’s a telco business guy at heart. What’s worse this levy is likely to stick and be included in future pricing. This was the funny bit. The government pass the buck to OFCOM who pass the buck to the ISPs who pass the buck to the rights holders who take kids to the courts. This, of course, is unworkable. It’s a charter for lawyers. “a court-based process of identity release and civil action" We’ve been through all of this. You can’t take millions of people to court, most of them children. Send them letters if you will – they’ll be ignored. Customers will be outraged that their services will be cut because of file sharing by their children from sites they’ve never heard of and over which they have no control. “NESTA will pilot a simplified IP framework for digital media bringing together PACT, the Cabinet Office, Kew Gardens and Arts Council England.” Kew gardens? This bag of quangos will take years to get an agenda together and another couple of years squabbling and by that time the world will have moved on. On p199 there’s a peculiar paragraph on Botanical gardens and Kew. They’re a leading edge digital media organisation, allegedly!!!! Someone on the report team must be fond of gardening. 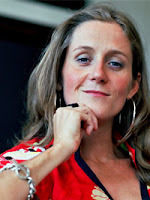 Martha Lane –Fox is our new Champion for Digital exclusion. Martha is to represent the estimated six million adults who are both socially and digitally excluded. I think not. Martha, bless her silk socks, doesn’t know any poor people. This is like appointing Wayne Rooney as Champion for Higher Education. Here’s an interesting paragraph...“Among non Internet using groups a common response to “digital self-exclusion” is that they say they are living contentedly offline and see no real need or benefit to going online. Despite the advantages of digital participation, as outlined in this document, 43% of those asked in a recent Ofcom study said that even if offered a ‘free computer and broadband subscription’, they still would not choose to be online.” Wow! It pops up, is ignored, yet the whole report is premised on the idea that it’s good for them. This is an idea that needs to be explored further, but it is not. The reports a messy, fudge that focuses far too much on old media. BBC is mentioned 169 times, Google gets 6, FaceBook 5, Twitter 3, YouTube 2, iTunes 1, Games 0, Xbox 0, Playstation 0, Second Life 0, Wikipedia 0. It’s as if the internet doesn’t really exist and that the digital future is an issue for broadcasters. 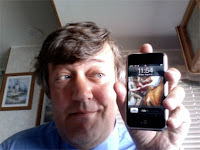 The Digital Britain conference ended with a speech from Stephen Fry. The Digital Britain report has a quote from Stephen Fry. Why Fry? Why has he become the touchstone for technical advice? Because he uses Twitter. That’s about it folks. I also hate the quiz show QI (is that the most patronising title for an entertainment show ever? ), with the smug Alan Davies et al playing around with puns in that sneering, pseudo-intellectual style, so beloved of Radio 4 listeners. The tour of the US in a London Cab was pathetic, a truly patronising piece of junk. All of those bit parts in third rate British movies and now the awful Kingdom – a drama about a lawyer (compelling idea eh?). Then there’s that pathetic letter he wrote to himself, pretending to be some sort of modern Voltaire. Don’t get me wrong I don’t hate Stephen Fry, it’s the idea of Stephen Fry and his sycophantic audience I dislike. What, in the end, is Stephen Fry? He’s a TV presenter and bit actor who’s written some pot-boiler paperbacks. A National Treasure they say, one I’d like to bury. A ‘wave’ is a group conversation with lots of added functionality. There’s work waves, product waves, party waves – waves allow you to do whatever with whoever, whenever. It works, in pretty much real time, because it’s all in the cloud. You can also have ‘Learning Waves’. Waves are hosted conversations combine email, messenger and social networking and media sharing – faster, more like real F2F group conversation with playback, drag and drop from desktop to browser. It pulls in mobile, blogs, Twitter, aggregates conversations, allows group editing, docs can include wave conversations (hide & show), spellchecks as you type, creates links a you type, polls, supports multilingual and has real time translation in 40 languages. APIs allow you to use and extend these services. So that’s it, an open source, browser-based, personal communication and collaboration tool – Google Wave. The productivity improvements in all forms of human endeavour are phenomenal. So what’s the impact on e-learning? First, the creation of e-learning content should be quicker and cheaper. The design, development and delivery can all benefit from Wave as a productivity tool. You can get the design done with designers, SMEs, managers in real time, or at least much faster than the traditional methods, even with people who speak different languages. User-tested development can be very quick and debugging and testing much faster. Second, Wave could be used to teach and learn in groups. Think of a 'wave' as a learning experience, a ‘learning wave’. 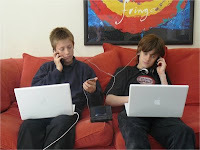 My lads are doing ‘work experience’ this week, in an e-learning company, and loving it. Exposure to a real, adult, work environment has certainly made them think. “We didn’t finish until 5.30!...People are really nice” You can see them mature as they have to arrange travel to work, buy their own lunch and generally get organised. This is a really worthy initiative. However, there are some peculiarities to the whole thing. Kids with ‘connected’ parents get better placements, so that placements mirror socio-economic structures. Wouldn’t it be better to get a list of placements and then match, or do a lottery, based on interests and so on. The current system seems to set aspirations according to parental interest, connections and class, not student interests or ability. This system seems to have evolved as, in the absence of an organised system within many schools, the middle-class parents organise placements for their own kids. Rather than establishing long-term links with employers, much is left to the last minute resulting in panic, cancelled arrangements and a scramble for placements. Organisations and businesses should be invited into schools to talk to students about their businesses, organisations and work. For example, Business Studies is often taught by people who have no real experience of running a business, yet with this wonderful free resource on their doorstep, why don’t they use it. The truth is that many schools have an old-fashioned anti-corporate ethos. I’ve experienced this hostility personally as a Governor. Both business and education should be more entwined. Health & safety nuts cause chaos by demanding too much costly paperwork and too many visits. Many good placements were cancelled in my local schools because the H&S forms/visits hadn’t been completed in time. Surely one could assume that a major company adheres to health and safety standards at work, as they are mandated by law to do so. It doesn’t need all of this paperwork and site visits. What was fascinating about my boys’ reactions to their work experience was their reverse reflections on how odd ‘school’ was. They were surprised to find the workplace as a normalised environment, where people generally behave well towards each other and get on diligently with their tasks. They were surprised that managers didn’t have to whip the workers into action. School suddenly seemed very odd. Full of teachers shouting, demanding and corralling students into doing things they often don’t want to do. School is a crowded, unnatural environment, with lots of marching around corridors on the hour and bells. You’re stuck in a single age group and crammed into classrooms. Schools, I suspect, have a lot to learn from the modern workplace.